Not too long ago I got a box from Bumblebar. Their logo prominently features a bee, so I figured the plethora of energy bars inside had to have some kind of honey or pollen food commonality. This is not the case. 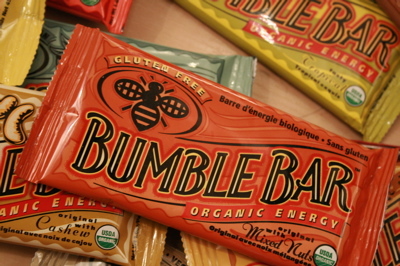 Bumblebars are organic and vegan, socially and environmentally conscious, and produced in Spokane WA, but they apparently do not involve bees. But all the flavors are based on sesame and flax seed, and even if I’ve never sought out vegan products as an issue of principle, I do find sesame and flax tasty. The bars are made with brown rice syrup or agave as sweeteners and are high in fibre and essential fatty acids. They are designed to provide sustained energy without sugar spikes or crashes. I find the texture satisfying without being overbearing, as the toasted seed base is a welcome break from the styrofoam quality of the hoards of energy bars with a crisped rice structure. However, Bumblebars are more suited to moderate riding, or post-ride. In a fast ride scenario, I want something like a gel block that I can scarf down fast without distracting me from the demands of the riding environment. Also, if you are already bonking, the calories won’t become available fast enough. I like the nut-flavoured Bumblebars more than the fruit, as the fruitier ones were hard to liberate from the wrapper when the summer’s heat made them soft and sticky. I’d say my favourite was the Cashew. You can buy them direct from Bumblebar on their site.